I'm much more concerned about space combat and ship constructor rather than about starlanes. and i still think that starlane (landscaping) system is a good idea but as one of the layers together with jumpgates system and slow-limited range "FlyAnyWhereYouLike" system. and warp point is a better way to represent starlanes mechanics. that's for sure. Edited by JeanBaptisteEmanuelZorg, 15 February 2016 - 04:52 PM. I still don't understand why is it so difficult to add a slower off road travel, even using the warp points. Endless Space with all those starlanes, has free movement as a race trait and as a tech. Edited by Vahouth, 15 February 2016 - 06:38 PM. Lol, yes that's true, as it stands MOO 4 is shaping up to have the THE most draconian, strenuously enforced restrictive movement of any 4x game ever made..... including MOO 3. Its a very bad sign when MOO 3 does something better, alarm bells should really be ringing load and clear. btw I like your new avatar . Plus, it was the first race I ever played. Edited by Vahouth, 15 February 2016 - 09:01 PM. Any sign of further multiple-choice research unlocks like the Genetic Mutations research leading to a choice between Heightened Intelligence and Psionics? I'm assuming the ones you've been posting of late are research projects that unlock ALL of the resulting applications (like Creative trait research does in MOO2), and not just the highlighted ones. Imo those screenshots are from an early build and the only purpose why devs still post it is to keep fans attention at official forums. Edited by JeanBaptisteEmanuelZorg, 17 February 2016 - 10:32 AM. 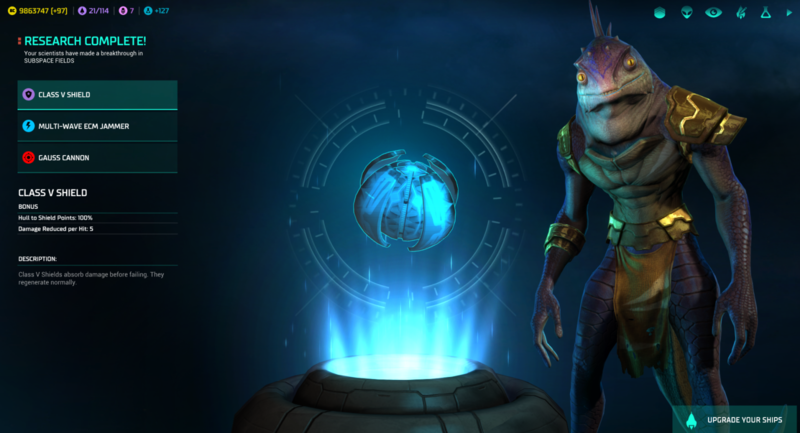 It may not be an earlier build but instead a custom race with creative trait to showcase the techs. Ah... oh well. Was a bit hopeful of more information. In any case, I find the Class V Shield stats very interesting. One of the things that really turned me off from emphasizing shields in the late-game of MOO2 was just how WEAK compared to the hull/armor/structure they ended up being, especially on the larger ships. I've got a game of MOO2 going right now where my Titans have Xentronium Armor (claimed from the Antarans, of course) augmented by Heavy Armor and Reinforced Hull which results in 2400 hit points for both armor and structure for a total of 4800 hit points of defense. If I equip Class X shields and then use Multi-Phased Shields with them, I get 375 points of shield strength for the enemy to fire through with a 10 point reduction in damage. However, if I equip a Damper Field I reverse-engineered from the Antarans, I can instead get a 3/4ths reduction in damage universally and regardless of whether a defensive layer is still up and functioning (I lose shield integrity, I lose that 10 point damage reduction benefit, but the Damper Field never goes away). I note that in that screenshot, the Class V Shield says it gives a 'Hull to Shield Points' of 100%. In the case of my Titans, that would be 2400 or 4800 shield strength, either of which would be amazing (even if you obviously remove the Heavy Armor and Reinforced Hull bonuses, that's 800 or 1600 theoretical strength, which is more than twice what Class X has in MOO2 with Multi-Phased without needing to use Multi-Phased).... And that's just the Class V! To think of how phenomenal the Class X Shields would be! I am normally a shield kind of guy anyway- the only reason I have stopped valuing shields in MOO2 is because the Antarans can just burn through shields like they are nothing, but the Damper Field and Xentronium Armor, once I've taken those from them? I combine those with Automated Repair Unit, Heavy Armor, and Reinforced Hull, and my Titan fleets become veritable unstoppable juggernauts to the Antaran menace. If I had shields as strong as either my armor or my structure, let alone the entire hull strength, I would be using Multi-Phased Shields, Shield Capacitors, and Hard Shields all the time instead of ARU, Heavy Armor, and Reinforced Hull. Edited by StormhawkAPS, 17 February 2016 - 11:23 AM. 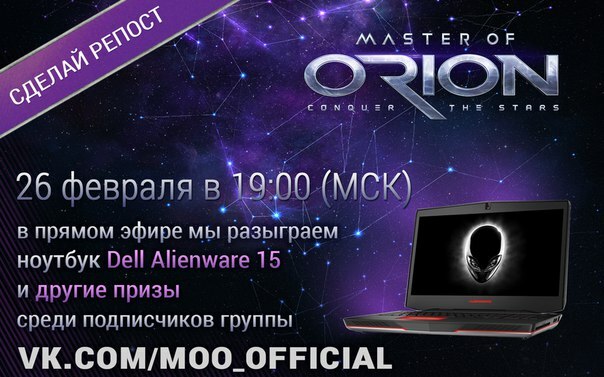 It's mentioned below that a notebook as a prize will be awarded to one of those who makes message repost inside the russian social network vk.com. The point is, that some great news are coming by 26th of February. Early access ??? Edited by JeanBaptisteEmanuelZorg, 17 February 2016 - 11:18 AM. Normally, I'd say 'bleh' to Alienware, but free laptop is free laptop. Good luck to whoever enters, then. What kind of news we'll get by 18th and 26th of February I wonder... Hopefully not only about the prize winner. So, any comments on the shield strength subject? Or should we avoid ship build discussions here? I also think 100% of hull points seem quite a lot, especially for mark V. I wonder what other changes it entails for weapon damage if any... Maybe it is a change that plays better in a RTS environment so that destroying a ship takes more than 2 seconds. All the same, I like the idea of shields being stronger. They were just paper in comparison to the solid defenses of ships and equivalent or better technology weapons in MOO2. The only time I feel Shields actually make much of a difference has been when I have decent ones early-mid game against less-advanced races. The moment I find a technological equal or face the Antarans, Shields feel virtually useless. It would be good if shields and armor were both as powerful but were along different research branches and you had to choose which ones to follow to specialize. Good idea, and not a new one. Pros : assymetric race balancing Cons : Stone-Paper-Scissors -> ES, GalCiv... Not in Moo2 spirit. Shields are more about denying special effect and making early game weapons obsolete then absorbing a lot of damage. Structural analyzer and achilles targeting unit are wasted on shields so that's basically 4x effective shield HP late game. Graviton beam and ion cannon are plain boring weapons vs shields. Transporters don't work vs shielded targets either. AI doesn't use it but I enjoy neutron beam + transporters or tractor beam combination when playing ground combat race. Damage reduction is big deal. Early shields bring an end to miniaturized AF AR NR laser nonsense and force the use of bigger and less versatile weapons. Later on hard shields and energy absorber can stop most midgame beam weapons and seriously reduce late game weapon effectivenes. The problem is they take too many special equipment slots (I wish they were shield mods instead) so I usually don't install them on beam ships. Missile ships on the other hand don't have many damage boosting specials so I tend to put a lot of defenses on them, auto repair, reinforced hull, energy absorber and good shields can survive a lot of beating. And finally, in the late game I punish all unshielded enemies (including Loknar) with ion cannons because of cheese . There is reason why they made Antarans immune to it. Well, as I explained earlier, part of the reason why I stop emphasizing shields is how the Antarans pretty much shoot past them like they were nothing with particle beams and such... and then I go out of my way to steal their Damper Fields and Xentronium Armor to fit on my ships to fight against them; Damper Field makes Shields feel insecure about themselves so long as you're not dealing with Ion Cannons and have the best armor plus Heavy Armor, Reinforced Hull, and Automatic Repair Units to augment- Antarans can't seem to do much of anything to Titans such equipped, and the AI doesn't tend to exploit the Ion Cannon vulnerability, so I can use it for anything else, as well. You talk about damage reduction? That's why my argument was hinging on the Damper Field in my main treatise on this subject. Edited by StormhawkAPS, 18 February 2016 - 09:53 PM. Antarans are bunch of cheaters, they are immune to ion cannon, damper field nullifies neutron beam special effect and I'm pretty sure particle beam is shield piercing only to mess up with players. Once you steal the tech it's not that spectacular because you'd have AF phasers by then. How early do you start capturing their ships? By the time I get big enough assault shuttle carriers the game in a phase where a lot happens each turn and because turns advance much slowly it seams like whole eternety between Antaran raids. If I don't get lucky with Antarans early enough their techs become irrelevant, once I hit hyper advanced tech levels (and the game is still not over) I start making beam glass cannons which can wipe whole fleets in 1 turn alone. By damage reduction I mean that flat minus to damage that shields have. It's not to be underestimated, if you force the opponent to ditch phasors and plasma cannons you saved yourself from much nastier threat then death rays and stellar converters. Oh and frigates and destroyers have a lot of shield points per hull point. What makes damper field seam powerful are AI incompetence at designing ships and the fact it takes only one special equipment slot. About MoO:CtS screenshot, shield point per hull point might not take armor bonus to account. For example if player has zortium armor that multiplies hull points by 4 then class V shield might have only 25% of hull strength. 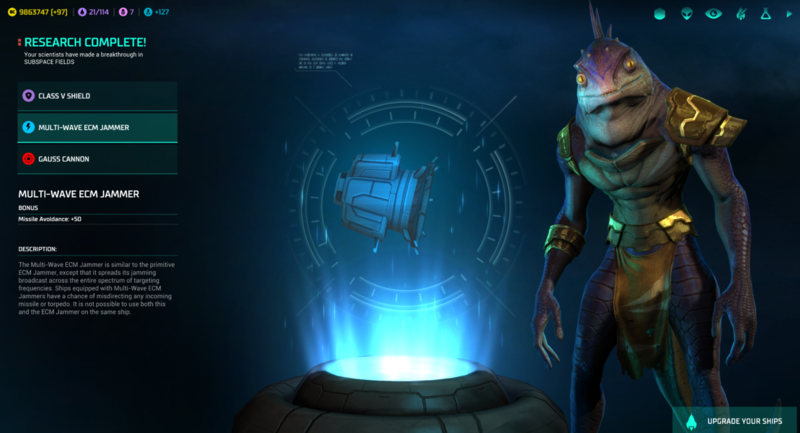 I actually don't bother with the Antarans' weapons- just their defensive technologies. If I get lucky with my assault shuttle destroyers (with enough space expanding tech, I can get three shuttles on them and the shuttles launching can be the first action of anyone in the battle with good enough computers and engines and such) with the second wave of Antarans, I can usually capture 2 out of the three Antaran small ships (the third one usually self-destructs), and hope that I get Xentronium and Damper Field from them; everything else except maybe Reflection Field (though I've never actually used it) I don't care much for. As you say, AF Phasers and Gauss Cannons. But defensively, I get that Xentronium, the Damper Field, Heavy Armor, Reinforced Hull, Auto Repair Unit... The AI has no idea how to deal with that defensive arrangement, it seems. And yea, smaller ships seem to have much better shield-to-hull ratios, which means they still use shields instead of Damper Field, generally. And that's an interesting thought about the raw hull points, and I suppose it would be best if that's how it worked. EDIT: Actually, I looked into it... and that sort of 'raw hull points' argument means these shields would be even weaker than MOO2's- My Titans can have 125 shield strength from a Class V shield, and, as far as I can tell, their raw hull would be 80 hit points without any armor or hull-improving specials. Edited by StormhawkAPS, 19 February 2016 - 09:38 PM. If I were to guess, I'd say that shield strength percentage is measured by using unmodified hull points.